I received many baptism reports every month but I cannot put them all in a newsletter. I usually just pick a few reports each month. July’s newsletter will focus on: 1) mass baptism in Southern Mindanao Mission, 2). Mass baptism in Davao Mission, 3) the gathering of around 200 adopted ministers in Mountain View College, and 4) the story of a very special member of our organization. His name is Retchi Ubod. I have written the story of Retchi Ubod back in 2010. 1). 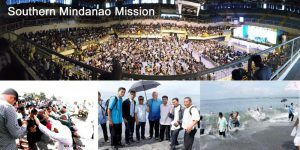 Over 1,600 were baptized during a mass baptism in Southern Mindanao Mission: A mass baptism during the Dan Smith crusade resulted to a total of 1600 precious souls that accepted Jesus in General Santos City, besides other baptisms in other areas of Southern Mindanao Mission. Eighteen adopted ministers supported this particular crusade. To God be the glory. 2). 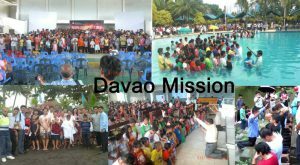 Mass baptism in Davao Mission: For the month of July, the adopted ministers of Davao Mission, with the help of other adopted ministers from the neighboring missions, started a campaign: A Reaping Harvest of 10,000 Souls during a 3-Month Campaign. So far, for the month of July, a TOTAL of 2,359 precious souls were baptized in Davao Mission. 3). Rededication Ceremony of adopted ministers in Mountain View College: Around 200 adopted ministers from missions all over the Philippines attended the Sabbath School Congress in Mountain View College. The adopted ministers, through the leadership of Darlene Sabandal, our AMI coordinator, came together during a Rededication Ceremony in one of the Halls in the college campus. We Christians wish for Jesus’ soon return. But are we helping in hastening His coming? Are we going out of our way to share Jesus with others (friends, neighbors, families, strangers)? Here is the story of a young man who is making no excuses for not sharing Jesus with others. Retchi Ubod, 24, young man born without limbs was raised in a Christian home. His grandfather was a protestant preacher for many years. Retchi wrote me in March 2010 while he was taking computer classes in Davao, Philippines. Retchi had many wishes in life. He wished he could ride an airplane, go to Manila, and see the beautiful resort of Boracay. We wanted to give Retchi his life’s wishes and so he was able to see the places he only dreamed of. After Retchi went back home, he continued to write me. He hungered for more Bible truths and was given Bible studies by one of our adopted ministers. He was very happy to find new friends who cared for him. He asked to be baptized. Retchi wanted to share Jesus to others. Soon he was sharing his personal testimony in churches, in gatherings, in the radio. He wanted to do more for God, and so he asked to be trained how to give Bible studies. He was given training. Two years later, he was ready. So, when Retchi is not speaking in front of people, he is sharing Jesus in people’s homes. One family that he visited was really poor; Retchi brought them rice during his next visit and they were very grateful. Retchie also visited the inmates in jail and where he gave talks to encouraged them and let them know that Jesus loves them. This year 2014, Retchi has already visited many homes. Last March, ten (10) of his Bible students accepted Jesus through baptism. Last April and June, Retchi helped with the groundwork for a crusade and 8 people were baptized. Since the start of 2014, Retchi has already brought 18 people to the feet of Jesus.